Comet orbiter Rosetta has captured our hearts these past twelve months, but like all space probes before it, this one will eventually be put out to pasture. Of course, a productive scientific mission demands a dramatic finale, and so, when Rosetta runs out of fuel and funding next September, the European Space Agency will crash its prized probe into comet 67P....as gently as possible. 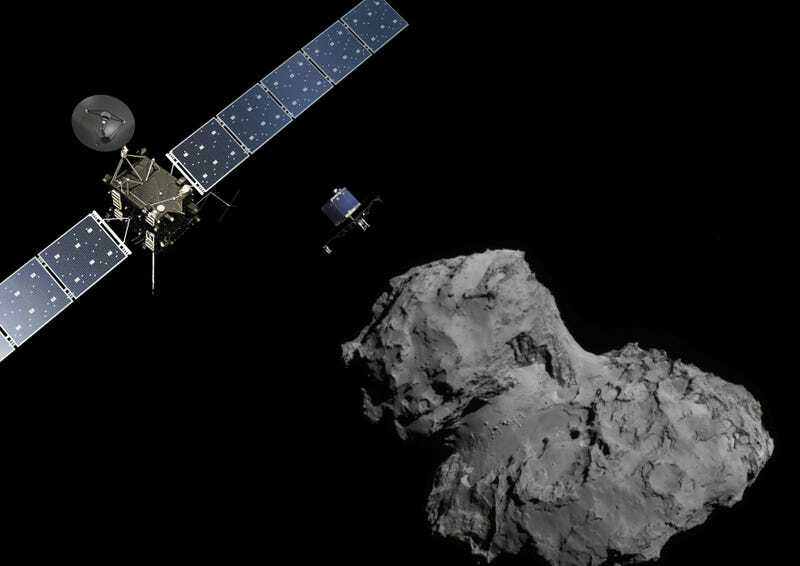 Laying Rosetta to rest on the comet it’s been studying for over a year isn’t just a PR stunt. By slowly approaching comet 67P early next fall, Rosetta will afford its science team the opportunity to collect high-resolution surface images and even more scientific data before it finally falls silent. The Rosetta space probe launched over a decade ago, but it didn’t catch up with comet 67P until late last summer. After several months in orbit, Rosetta dropped the Philae lander onto the comet’s surface, marking humanity’s very first (bumpy!) cometary landing. Philae fell silent after 57 hours of data transmission and has been inactive for months now, although it woke up from its slumber to utter one little “Hello, Earth!” in July. Meanwhile, Rosetta’s scientific operations have continued uninterrupted. 67P, we’ve discovered, is a fascinating little world, complete with complex surface dynamics, primordial oxygen, and organic chemistry. It’s even got its own little weather system. But the Rosetta mission won’t last forever, and the team behind it has been quietly preparing for the end since last year. Funding runs out in September 2016, and by that time, comet 67P will be well on its way to deep space; too far from the Sun for Rosetta’s solar panels to function. Crash-landing onto the comet appears to be the preferred means of disposal, and Rosetta’s orbiters and navigators are working hard trying to figure out how best to do it. They’ll want the spacecraft to descend slowly; this will give Rosetta time to take new images and collect additional data along the way. According to Nature News, the Rosetta team is envisioning that the craft will spiral down to a distance of approximately 8 kilometers (5 miles)—the same low orbit it achieved when it dropped Philae to the surface—next August, before creeping even closer in a series of elliptical orbits, eventually crash-landing in September 2016. One way or another, once Rosetta is on 67P’s surface, it’s game over. The probe will no longer be able to point its antenna at the Earth or angle its solar array toward the Sun. It’ll remain in its cold, dusty resting place until it’s devoured by a cometary sinkhole, or perhaps until 67P crashes into another planetary body. Eventually, ever last atom of Rosetta—just like 67P itself—will disperse back into the cosmic void from which it came.